Pictured, Jacob Basset checks out his team’s cereal purchases at the 2017 Supermarket Sweep. 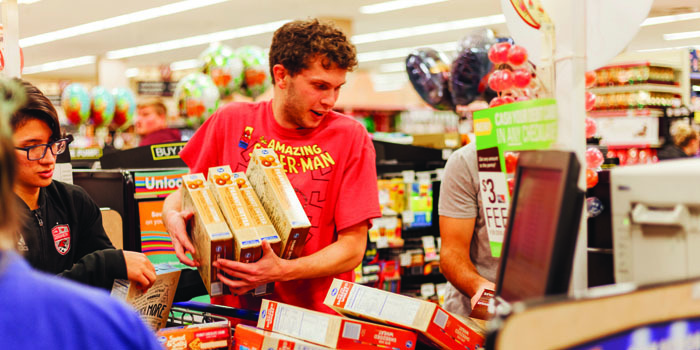 WINONA LAKE — Grace College and Mission Point Church are partnering to sponsor the 9th annual Supermarket Sweep on Wednesday, Nov. 7, at Owen’s Market, 2211 E. Center St., Warsaw. The community is invited to participate; grocery lists will be provided to the public from 10 a.m. until 10 p.m. at Owen’s. With the holidays approaching, Supermarket Sweep is a fun and easy way to help local families in a tangible way. Participants shop for non-perishable food items and baby products which are then donated to organizations that support community members in need. This year, donations will go to Combined Community Services, the Salvation Army and Heartline Pregnancy Center. Grace students, faculty and staff participate in a large way to support this mission. From 8:30 – 11 p.m., Grace teams shop while competing for prizes in categories such as the most money spent, the most money saved and the most community or staff members present. Last year’s Supermarket Sweep raised more than $24,000 worth of food and products in 11 hours. Director of Student Involvement at Grace, Kearstin Criswell, hopes this year will be even more successful. “We hope community members will make plans now to participate on November 7 and help us provide for our neighbors in need this holiday season,” Criswell said.